An ancient gold ring thought to have inspired JRR Tolkien to write The Hobbit is being exhibited for the first time at The Vyne, in Hampshire, UK. The ring, which is inscribed in Latin, has been linked to a Roman curse tablet. Archaeologist Sir Mortimer Wheeler is believed to have discussed the ring with JRR Tolkien after realizing its connection to the curse. The ring was found in a farmer’s field in Silchester in 1785. The ancient artefact is also inset with an image of the goddess Venus, and lay forgotten in the library of the National Trust property for several years. It is believed Sir Mortimer Wheeler asked for JRR Tolkien’s expertise in 1929. JRR Tolkien was Professor of Anglo-Saxon at Oxford University. The ring has been linked to a curse tablet found at the site of a Roman temple dedicated to the god Nodens in Gloucestershire. JRR Tolkien worked on the etymology of the name Nodens and repeatedly visited the temple. His fantasy novel The Hobbit was published in 1937. 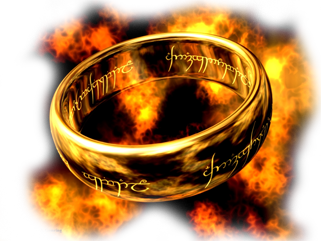 The “One Ring”, which plays a central role in Lord of the Rings, is also gold and contains an inscription in a fictional language called the “Black Speech of Mordor”. A “Ring Room” has been created at The Vyne in association with the Tolkien Society.